Mrs. Linda Breeze has been employed by Bluford schools for the past 18 years. In her current role, she monitors and maintains the elementary computer lab. Everyday, every student in grades K-8 visit her. During this time, students have a wide range of interactive games and learning tools to choose from. Over the years, Mrs. Breeze has compiled a gallery of age appropriate learning sites for students. 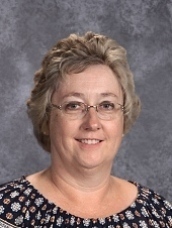 Through the last 18 years, Mrs. Breeze has served as a classroom aide in the early childhood program and special education rooms, as well as serving as a 1:1 aide. Mrs. Breeze is so versatile in her capabilities that she even knows every stop on EVERY bus route. When a need arises for a sub bus driver, she rides along ensuring all of the students make it home safely. Every year, Mrs. Breeze really looks forward to the first day of school. She shared, "I love to see how much the kids have grown and changes over the summer." In her spare time, Mrs. Breeze enjoys shopping, reading, and spending time with family. In the future, she would love to visit the Grand Canyon.